What a great way to start off a blog hop -- Memorial Day! Don't miss out! We just added 2 more designer to our hop!! The Design Teams of Stampendous and Linnie Blooms have traded product and are ready to show you their creations! Here's the link and schedule of postings. Please show them your love by leaving them a comment! Commenter's on the Linnie Blooms' Design Team blogs will be entered into a drawing at the end of the week! 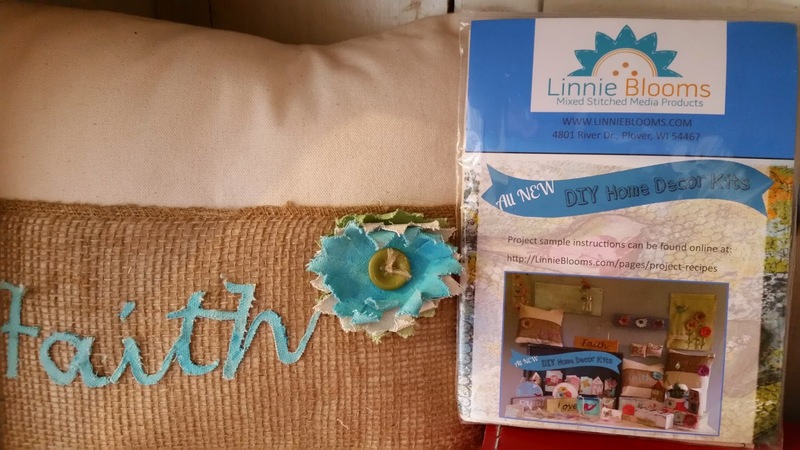 At the end of the blog hop, Linnie Blooms will be giving away a FREE All New DIY Home Decor Kit! So be sure to leave a comment on our Designer's blog to be entered to win! Glad to meet you!!! I am desperately trying to leave a comment on Ann's blog but it when I click on the comment box it just says "opening" and won't allow me to comment. UGH! Technology is a bummer sometimes! Also, can't find Trish or Dawn's blogs because the links are not working. LOVE the projects I have seen using your products on this hop! Will keep checking back to see if the links are fixed! TFS! Sorry about the troubles Barbara. Nice to have you stop by! We are working on the issues with Trish and Dawn's links. Stay tuned! I got to post on all of the designer's blogs today and their projects were well worth the wait!!! Fabulous creations!!! Looking forward to the rest of the week!! I am now following on Bloglovin' so I don't miss a post! OMG!! Dawn's lovely creation has me speechless! I am in love with every little detail of it!!! What a fabulous week hopping with two fabulous companies!! So many inspirational and fun creations along the way! Thanks for having me along on this journey! We are so glad you enjoyed the hop Barbara! This looks to be a great blog hop. Thanks for sharing these projects with us. Thanks for stopping by Judy! Fun hop... gathering ideas for future use already... Thanks! Thanks for stopping by D.Ann! Thank You for sharing all of these great ideas using your products. I'm new to you, and I am very interested in what you have to offer! I'll be checking in regularly! Thanks for checking us out Gina! Awesome projects today! Great to 'get to know' your company!! Thanks for sharing. Glad you stopped by to get to know us Katie! Very excited to see what the team members are creating this week!!! Glad to find a new company. Love the projects I've seen. thanks for having the hop and for joining with Stampendous. You really complement each other. Thanks Mary! I think they work great together too! the new DT additions have some wonderful projects. So glad I've discovered you. I want that file folder - it's so versatile. So glad to discover your company. The projects are wonderful. Thanks for stopping by McStamper! Wonderful and creative projects on the blog hop. Thanks for visiting us Sue! I'm so glad to get to know your company. I love all the projects . Thanks for sharing. Thanks for stopping by Yolanda! I know! It's such a treat to get up in the morning and see what's new to look at! Thanks for stopping by! Such amazing projects and inspiratioN! Thank you for the hop! We are as inspired as you are Jean! Thanks for joining us! Well, I know I am a bit biased as I am on the LB team, but I just had to say that WOW! it is so much fun to see all the different projects every day. Way to go everyone. So many awesome examples today! Thanks so much for sharing. Great hop! I love all of the techniques and inspirations. I'm so glad you got something out of it! It's been an amazing week of hopping. Glad to find your unique company. I'll be sending an order in soon for those file folders. Here's hoping to win the prize from the hop. Love to play with new crafting items..
Good luck to you Mary!